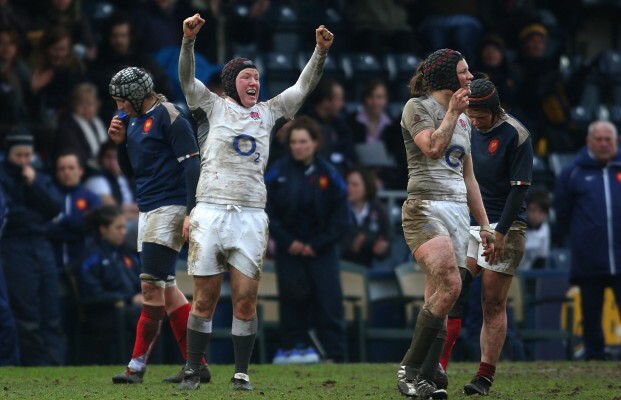 Karl Cross tells us why Rochelle Clark deserves to be lauded for her achievement of her 100th cap which she will win for England this weekend when they take on France in the final game of the 2015 women's Six Nations. "On the 15th of February 2003 I was on my way to Twickenham to watch my rugby hero Jason Leonard receive his 100th cap against France. The first for a front row forward and an example of the standard he set as a player whose career overlapped the transition from the amateur era to the professional one. I still have the match ticket from that game and the badge with 100 on it that were given out before it. Leonard went on to be part of the squad that won the world cup in 2003 and went on to amass 114 caps for England. This weekend, in a bizarre coincidence, again at Twickenham and against the same opposition, another one of my rugby heroes achieves this same milestone. Rochelle ‘Rocky’ Clark has long been England’s front row constant. Unlike Leonard, who had to wait till November that year for his world cup moment, she will achieve her milestone with the world cup winner’s medal already locked up and safe. Also unlike Leonard she has never played under the professional code, because professionalism for the women’s game is still only seen as something for the 7s specialists. Those without that elusive contract, continue to train to the highest professional standards while working in a variety of other jobs. Rocky is a unique rugby specimen. It is difficult to actually define the level at which she works at. Here are some statistics which may help those who know about rugby to understand: In this year’s Six Nations match against Ireland, Rocky was the top tackler. She attempted 23 tackles and was successful with 20 of them. She also made 16 carries. For those in the know, those stats are player of the match stats for a back row forward. If you add the metres she covers on the pitch, and remind yourself she is a prop, it proves her work rate is one which very few are capable of. I have mentioned her try rate in the past, but 21 international tries? It doesn’t matter where they come from, you have to be in the right place to score them and you have to still work hard to get them over the line. To do it 21 times isn’t luck – that’s pure lung-busting effort. When Rocky achieves her 100th cap on Saturday she will become the joint highest cap holder with another England legend Amy Garnett, someone I know Rocky has always looked up to and been inspired by. Amy, like Rocky, was a player who knew no other way on the rugby pitch than going forward, being bloody minded and determined to achieve her goals. The situation with the 7s professionals has made this Six Nations a difficult one for England. I imagine for a player like Rocky it must be tough to go from the high of the World Cup, to then be fighting for pride in the Six Nations. But if anything I think it has lit a fire in her. As a player she is in the best form I have seen her in. She is in the best physical shape she has ever been and she knows the game better than most. Her skills as a player and as a coach are second to very few and she continues to inspire almost every player, young or old, man or woman. For me her unique quality is that she always wants to prove she deserves to be there, rather than being there as a cap-counting exercise. Rocky doesn’t want to be given a cap because of loyalty, but because she is the best player in her position. She still worries about her performances and where she can improve. For her 100 caps doesn’t mark an end point. She is driven to go on and on for as long as she feels she has something to offer. It’s hard to argue she doesn’t have a huge amount to offer when you look at her stats. As an example to the relatively young squad she shows what pride and passion in the shirt means. She is without question a competitor who is unable to ever take it easy. I can't claim to know what makes her tick. If you could find it and bottle it, it would be a very valuable commodity. If you could nail down the place she goes to that keeps her going to the very end of the game you would maybe be able to pass it on to the future generation’s of players. I suppose that is what makes her so unique; You can’t necessarily recreate it, replicate it, or pass it on, and that’s why she is still there and that’s why she is still competing to be the best player she can be. 100 caps is a monumental achievement and there are very few people who could ever argue there is a more deserving recipient. The fact she gets to achieve it at the ‘home of rugby’ is the icing on a cake that still has a few more decorations to add to it.